Geographic Information System (GIS) software can be used to determine the spatial distribution of environmental hazards. The ability to look at multiple layers of information on one map enables investigators to visually compare areas that contain high numbers of hazardous industries with variables such as socio-economic status and race. We used GIS in a classroom exercise to examine the distribution of toxic release sites in Queens, New York. Using 1990 census tract data along with Toxic Release Inventory (TRI) sites registered by the Environmental Protection Agency (EPA) for Queens in 2000, we created a series of maps to examine the relationships between the locations of known toxic releases and demographic factors such as race, education, income levels, and linguistic isolation. By using readily available digital data like TRI sites and census tract data this classroom project shows students the utility of GIS for analysis of environmental hazards. Our in-class exercise revealed 1) distinct divides between neighborhoods by race; 2) an association between the locations of TRI sites and Asian and Hispanic linguistic isolation; 3) correspondence between the locations of TRI sites and limited level of education; and 4) overlap between the locations of TRI sites and neighborhoods of low income. Although not a definitive environmental risk study, these findings suggest that neighborhoods with limited resources to prevent the siting of undesirable technologies in their communities or to move out of harm's way may be disproportionately subjected to environmental risks. Exercises of this sort are easily carried out by students with access to GIS. Such studies demonstrate to students the societal importance of integrating natural and social sciences. During the summer of 1999, a new type of field course was taught in five of eastern Utah's National Parks and Monuments. The course was unique because it targeted a combination of university undergraduates and K-12 teachers, emphasized development of participants' problem-solving skills, and assessed the effectiveness of several non-traditional teaching methods. The course's primary goal was to teach participants to develop and test their own ideas. The course also was designed to help participants learn to use tools and methods employed by research scientists. A mix of undergraduates and teachers was targeted so that the course could be used to introduce undergraduates to the concept of teaching as a career. A blend of pedagogical components was employed and tested during the course. Pre- and post-course attitudinal surveys, instruments designed to measure lower- and higher-order cognitive skills, diagnostic learning logs, and post-course interviews were used to assess the course's success at achieving six specific goals. The course produced an immediate impact on the attitudes, career choices, and lower- and higher-order cognitive skills of student participants. Although the initial results are intriguing, the assessments are not statistically significant for a variety of reasons including small sample size. Subsequent offerings of the course will be assessed in similar ways so that results can be interpreted with more confidence in the future. The "Where are We?" software and lessons are designed to help children in grades two through four learn to "translate" between the visually-perceived world that they sense around them, and the schematic representation of that landscape on a map. Formative evaluation of a prototype version of "Where are We?" 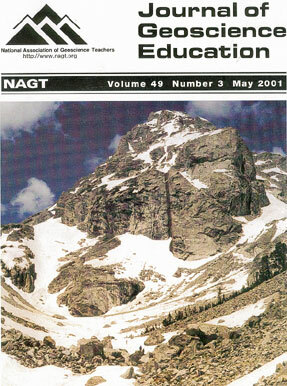 resulted in the following improvements in the instructional materials: more and prompter feedback for students, additional assessment tools for teachers, development of lessons to model successful map-using strategies, development of lessons to overcome common misconceptions, and replacement of text-based instructions with a voiceover demo. To evaluate whether he skills practiced in "Where are We?" transfer to a real-world setting, we have developed field-based tests of the ability to absorb information in the real world and transfer it onto a map, and, conversely, the ability to absorb information from a map and transfer it into an action in the real world. In our reality-to-map test, students place colored stickers on a map to indicate the location of similarly colored flags in the real world; in the map-to-reality test, students place large, colored, numbered disks on the ground to indicate the location of similarly-colored, numbered stickers on a map. Average performance for a class of 24 fourth graders improved on both the map-to-reality and reality-to-map tests after using Where are We? Some children classified with learning disabilities performed extremely well both with the software and on the field-tests, supporting the idea that spatial skills are not closely connected to the verbal skills usually emphasized by school tasks. The persistence of certain kinds of misconceptions on the post-test, and the uneven improvement of subscores representing different aspects of map-to-reality correspondence, suggest directions for improvement in "Where are We?" Liberal arts colleges have in recent years placed an increasing emphasis on research. In this environment of increased interest in research at liberal arts colleges we present a ranking of research in geoscience at national liberal arts colleges based upon articles published in GeoRef listed journals. We find that the research activity is highly concentrated among the top schools. We also find that liberal arts faculty are interested in teaching geoscience as measured by the number of publications in the Journal of Geoscience Education and that there is a positive correlation between faculty research at an institution and the undergraduates who go on to receive Ph.D.'s in geoscience. We have developed and tested a multifaceted curriculum for use in introductory earth science classes from the secondary-school to the introductory undergraduate level. The centerpiece of this curriculum is a project-based investigation of greenhouse warming that can be conducted during one or more lab sessions using off-the-shelf materials. Other facets of the curriculum include: 1) literature review, 2) review of popular-press coverage, 3) assessment of internet-based information, and 4) interviews of fellow students. Simulation of the greenhouse effect utilizes two fish tanks, heat lamps, and either laboratory thermometers or laptop-driven temperature probes. Experiments are run by creating a CO2-enriched environment and measuring the differential heating of that experimental apparatus compared to an identical control. This experiment can be run as a hands-on student project or by the instructor as a demonstration for larger lecture classes. This greenhouse experiment and the broader curriculum have been developed around the central theme of teaching students to distinguish (1) solid scientific mechanisms from (2) actively debated hypothesis from (3) the broader genre of misperception and misinformation. This process provides students the opportunity to gain a much deeper understanding of the climate system, the nature of scientific uncertainty, the burden of proof in ongoing research, and the difficulties in transferring scientific results to the public-policy realm. A highly structured exercise which was designed as a team-building exercise for managers can be used to demonstrate to science students the potential benefit of group decision-making. The exercise, which involves ranking of options for surviving a large earthquake, yields quantitative measures of individual student knowledge and how well the groups function. The Flash of a Century -Geologic and Environmental Concepts in Aldo Leopold's "Odyssey"
Aldo Leopold's A Sand County Almanac and Sketches Here and There is a classic of 20th-century environmental writing. Leopold's interests in natural history included significant awareness of soil and ecosystem processes while his knowledge of cultural history allowed him to understand the effects of till agriculture on the native prairie ecosystem. In one short essay, "Odyssey," he shows his appreciation of the fundamental role of geology to important questions concerning ecosystem stability and agricultural sustainability. "Odyssey" discusses geologic and environmental concepts such as time and progress, soil conservation, recycling of nutrients, and the resilience of complex systems with a clarity and beauty that make it both thought provoking and a pleasure to read. The essay is applicable in a wide range of geoscience classes as teachers seek new ways to present scientific material and to incorporate social issues into their teaching. The Earth Science Summer Institute for elementary teachers is a program of professional development in content and inquiry. The planning process, the design of the institute, and the course implementation meet the recommendations in the National Science Education Standards. The goals for the teachers participating in the Earth Science Summer Institute included acquiring a deeper and richer understanding of the Earth science content and learning science as science is done, through investigation and inquiry. Concepts and learning experiences were chosen that demonstrated the interconnectedness of earth science topics. The schedule for the week was intensive and sustained, and emphasized field-based inquiry, laboratory activities, group work/collaboration, and simulations. Teachers planned and conducted their own field based investigation of a self-generated question regarding an Earth science topic. Teachers' evaluation responses indicated that teachers do want to learn science content, especially the content that is directly applicable to their own teaching. However, they want to learn science in a way that engages them as learners and is more authentic to the way that science is done. Careful consideration needs to be given to choosing the instructors for the course. The impact on classroom teaching needs to be more closely examined.